The village of Duhiya lies just outside Bhadohi, the city famed for its carpets. It is here that all the dyeing of silk and woollen yarns takes place. Smaller artisan dyers working in the nearby villages are perfecting and innovating this ancient tradition. 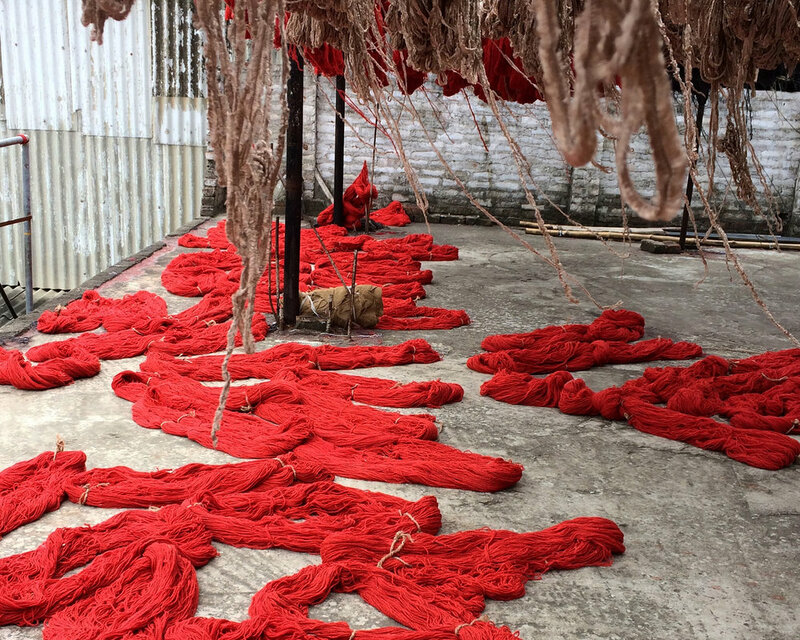 Coloured yarns in every shade are hung out to dry as soon as the Monsoon rains permit. Otherwise known as the "Carpet City," Bhadohi is home to the largest hand-knotted carpet hub in South Asia. It is truly an amazing place. I was lucky enough to be shown the entire process from raw wool to a finished rug, as well as the different technical knots used to produce them. Located on the banks of the Mekong River this extraordinary Living Crafts centre and award winning social enterprise Ock Pop Tok is a hub of expertise in both Laotian weaving and using natural dyes. I was fortunate enough to spend time here developing natural colours from local plants as part of ongoing colour research. After time spent chopping, grinding and boiling a variety of leaves and roots picked from the garden, an extraordinary range of wonderful colours were created from Teak leaves, Sappan wood, Annato, Jack fruit, Indian Trumpet Flowers, Lemon grass and Turmeric. Over the past few months I have been working closely with embroidery artisans from Herfah Women's Cooperative by supporting the artisans on commissions for luxury hotels. This has provided income, economic independence and pride in the local heritage. 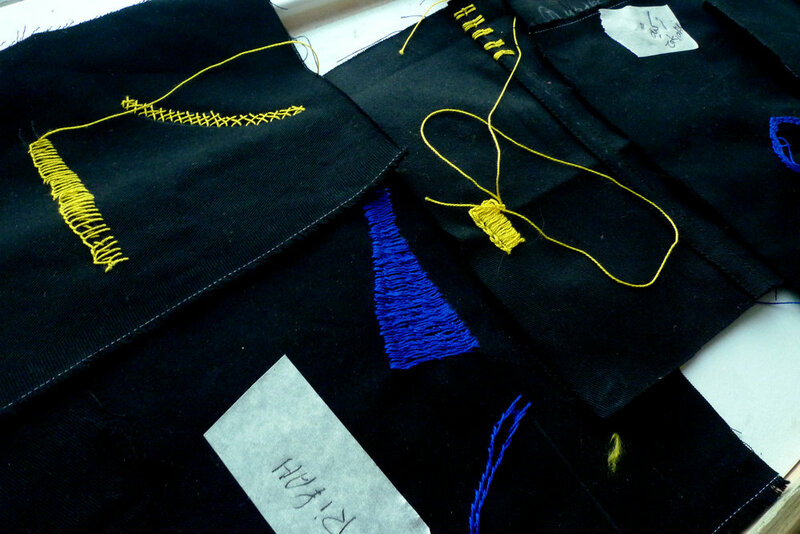 For the project itself, we have been developing work taking inspiration from nomadic traditions and regional textiles. Working with traditional embroidered imagery from nomadic traditions we identified the flower and sprig motifs inspired by desert plants. Amazing contemporary design from an incredible culture. For the past few months I have been working on an ongoing project with Turquoise Mountain Trust collaborating with several women's weaving cooperatives in Qassim. We are identifying and working with symbols rooted in Bedouin culture and heritage. Working on horizontal looms using the traditional sedu weaving technique, we are reinterpreting traditional patterns and motifs to create contemporary design for interiors. Zari gold embroidery is traditionally done by men in Bisht cloth hand-woven from the wool of lambs and camels. It is used principally on gowns for ceremonial and other special occasions. Working with Turquoise Mountain Trust, I have been collaborating with embroiderers in Al Hasa to adapt this heritage technique for new products. As part of the British Council Common Thread Residency I spent several weeks living with an artisan weaver Kenza Oulaghda collaborating on new product and learning about the incredible heritage of the Amazigh people. Kenza described about how secret messages had been sent by weaving the Tamazight language and symbols into rugs .The idea that that patterns and shapes could be arranged to communicate hidden messages and that an everyday object, the rug could carry such stories captured my imagination. The Association of Tithrite is a cooperative of 20 women based in a small mud building close to the mosque in the centre of the village. The weave “shed” has space for 3-4 vertical looms, it is far from spacious, there is no electricity so the weavers work during the day light hours only and return home at midday and times of prayer. Central to the village, the “weave shed” is a place not just for production but somewhere the women of the village come together to chat, laugh, sing and share stories whilst weaving, spinning and setting up looms. In Amazigh society the weaver, the wool and the loom are all revered. The beliefs and superstitions around the loom allowed me an insight into this magical world. The loom was blessed with songs and prayer before and during weaving, then when the weaving was cut down, the warp threads were splashed with salt and water to keep away bad spirits. I was once again fortunate to collaborate with Boubacar Doumbia of Ndomo on a new range of products using the indigenous "bogalanfini " mud technique. Working this time in his amazing atelier in Segou , Mali where the traditional architecture , surroundings and working atmosphere all contributed to great collaboration. This must really be one of Bangalore's best kept secrets . An amazing four floors of hand embroiderers . A truly inspirational place. Johnsons Tiles are a fantastic British brand and one of the greenest companies in the UK. I was lucky to take a tour around their factory and see behind the scenes how the ceramic tiles are produced.